· Each Institution/University can register for one team which may have a maximum of 30 members (including cast and crew). · Each team is to perform on one of the three days. Scheduling will be done by USADS. ·The performances should be of 20-25 minutes. ·Complete set up including stage, lighting, on stage microphones and multimedia will be provided by USADS. ·No indecency or vulgarity in the skits will be tolerated. 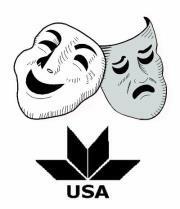 The skits will be screened by USADS before the actual performances.